Market Update: Should We Fear October? LPL Research on CNBC. Senior Market Strategist Ryan Detrick was on CNBC’s Trading Nation with Michael Santoli recently to discuss why October historically isn’t as bad as most make it out to be. You can watch the full interview here. NAFTA 2.0 is here. The U.S., Mexico and Canada have finally negotiated a revised NAFTA, now called the U.S.-Mexico-Canada Agreement (USMCA). Text of the USMCA, which outlines trade conditions for the U.S.’s two biggest export markets, will now enter a 60-day review period as Congress takes a look at the draft. The draft is on track to be reviewed in time for Mexico President Enrique Peña Nieto to sign it before leaving office on December 1. Stocks around the world have increased today on the positive trade headlines, and S&P 500 Index futures are modestly higher before the open. The week ahead. Looking ahead, the always-anticipated nonfarm payrolls report will be released Friday morning (Bloomberg consensus: +185K). 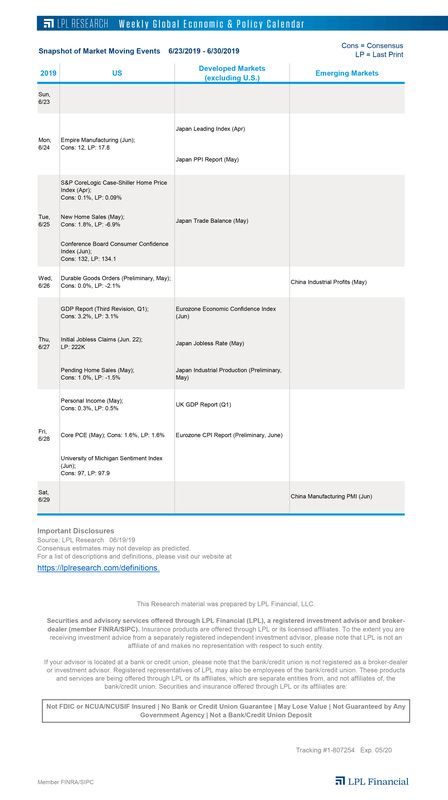 Ahead of that, manufacturing and services data are scattered throughout the week in the U.S., Eurozone, and Japan, highlighted by today’s Institute for Supply Management (ISM) Purchasing Managers’ Index (PMI) (Bloomberg consensus: 60). China manufacturing slumps further. Trade tensions between the U.S. and China are increasingly weighing on China’s manufacturing firms, especially smaller ones. China’s official PMI dropped to 50.8 last month, its lowest reading since February. China’s Caixin PMI, which highlights sentiment among smaller, private firms, fell to 50, matching the line between expansion and contraction. If manufacturing continues to slow, China may opt for more fiscal or monetary intervention to aid economic activity. Fed meeting takeaways. The Federal Reserve (Fed)wrapped up its most recent monetary policy meeting last week by announcing an interest-rate increase – an outcome markets largely expected. To us, the Fed’s projection and commentary on future monetary policyproved far more insightful than the policy decision itself. We’ll highlight our main takeaways from last week’s Fed activities in this week’s Weekly Economic Commentary, due out later today. Best quarter for the S&P 500 in nearly five years. Investors endured a flurry of trade headlines and emerging-market turmoil in the third quarter. Despite those and other headwinds, U.S. stocks were surprisingly resilient in what has historically been their most volatile quarter. The S&P 500 rose 7.2% during the quarter (7.7% including dividends), its biggest quarterly gain since the fourth quarter of 2013, its best performance in a third quarter since 2010, and the 11th gain in the past 12 quarters. In our latest Weekly Market Commentary, due out later today, we recap the third quarter and tackle the question of whether gains for the seasonally strong fourth quarter have been pulled forward.